This article describes a technique for converting RTF (Rich Text Format) data to HTML and provides C++ source that does it all in just a few lines of code. 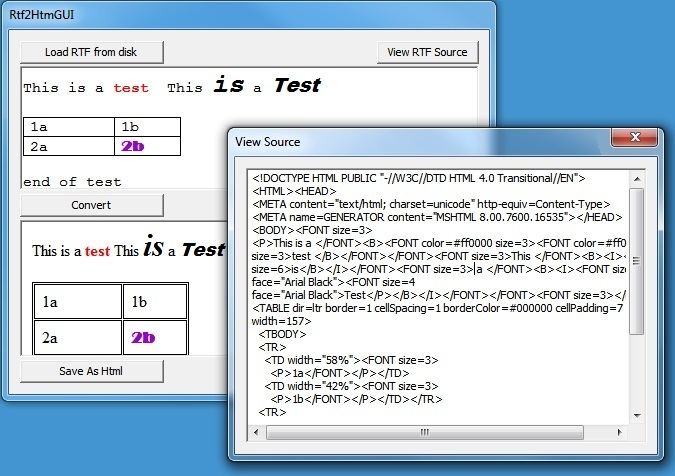 Although RTF is coming to be considered a "legacy" format, it is still in common use... possibly because of the ease with which a programmer can drop a Rich Edit control onto a form and allow the user to set fonts, colors, text formatting and even embed objects such as pictures and tables. Also, Windows comes with (and always has, and probably always will come with) the WordPad application program for creating, viewing and modifying RTF data. But HTML is the lingua franca of the day, especially for email communications. Anyway, it's not unusual to have an RTF file and need a way to generate HTML from it. Office Word automation can do that pretty easily, but one can't be certain that Word will be available on your customer's computer. There are some utility programs out there that try to convert the RTF tokens directly into HTML, but they are usually very limited; they tend to fail when the RTF data is at all complex (e.g., they can make text bold or italics, but that's about all). In searching for a simple, clean solution, I noticed that WordPad was easily able to convert HTML fragments (e.g., as Crl+C copied from a browser) into RTF. I wondered if the reverse was true... Could I paste RTF from the clipboard into an HTML editor window? In fact, WordPad, and the underlying Rich Text 2.0 Control will automatically place HTML data on the clipboard along with the raw RTF and the TEXT-only data. Load the RTF into a Rich Edit Control, copy it all, and paste it into an Html Edit Control, then save it out to a file or otherwise grab the HTML source text. // Rtf2Html.cpp : Defines the entry point for the console application. wchar_t szFilter = L"RTF files (*.rtf)|*.rtf;|"
All of the magic takes place on line 51 during the call to g_ctlRichEdit.Copy(); If you use a clipboard spy, you'll see that the RE control has placed HTML on the clipboard at that point. I was unable to locate an API call that would do that, but this clipboard-based technique is so simple to implement that I stopped looking. Note that in addition to setting the fonts and coloring, it has correctly created and populated a <TABLE> element (Incidentally, I used Office Word to generate the RTF because WordPad does not support creating Tables). In other words, the HTML conversion appears to be quite robust and complete. Also note that <META> tag on line, 4 which indicates the MSHTML was used to generate the HTML. Perhaps that's a clue to avoiding the clipboard operations. Like I said, I stopped researching when I found this simple clipboard-based solution. The opposite conversion also works, though it's not shown in the sample programs. If you select HTML onto the clipboard, and paste it into a Rich Edit control, the result is RTF data. You can pull it directly from the clipboard, or use the StreamOut function to save the RTF data. You will see some of the same anomalies in the RTF conversion that you will see when pasting into Outlook Express or Windows Live Mail; for instance, the line-ends are converted to <P> tags and that ends up with line-break spacing this is greater than seen in the original RTF. Font typeface may be somewhat off, especially if using the "default" (whatever that is) in the RTF. Background coloring does not seem to be supported, and the TABLE conversion also has some limitations. Picture objects don't make it across to the HTML. There would need to be a IMG source address in HTML, but the RTF data contains the picture as embedded data. It would take a bit of sophisticated coding to extract the image, save it to disk, and set up the <IMG> tag. In the attached project, I use an object that I derived from CHtmlEditCtrl. But it boils down to a thin wrapper that provides a simple means to stick it into a dialog box without the support of the VS Class Wizard. I understand that VS 2010 provides more direct support for the control. My goal was to show the sequence as simply as possible. If you try to bypass the "Open File" and "Save As" dialogs, the sequence will fail. That's because in a Console App, there is no message pump that would allow the two control windows to be created normally. If you want to create a command-line utility that does the conversion without interaction, I suggest that you start with a dialog-based app (as in the attached project) and just automate the process of getting the two filenames from the command line. I searched far and wide for a utility program that would convert RTF to HTML, and could find nothing that was satisfactory. But it turned out that the ability is built into standard Windows controls and that simple trick with the clipboard was all that's needed. label that is just below and to the right of this text. Thanks!